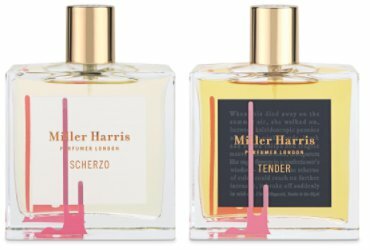 British niche line Miller Harris has launched Scherzo and Tender, new fragrances inspired by the F. Scott Fitzgerald novel Tender Is the Night. Scherzo ~ "An intensely vibrant scent, full of colour and a rush of sweetness, Scherzo captures a multitude of blooms: dark red roses, sunny yellow narcissus and crisp white pittosporum. The sweetness of tangerine is offset by the intoxicating purple richness of davana, which adds a twist of liquor to the scent. A base of golden olibanum shimmers with oudh, earthy patchouli and a sprinkling of sugar to capture the feeling of a confectioner’s window." Tender ~ "A scent of longing and seduction, Tender is contemplative and delicate. Unexpected freshness from sparkling pink pepper and green hyacinth, combines with an accord of ink and floralcy to inspire a reverie of black tulips. Fluffy pink clouds of peonies, luxuriant saffron, and the intensity of mauve stemmed roses. The lingering warmth of dusky storax and frankincense resins fuse with woods, musk and soft leather, creating a yearning and seductive trail." Miller Harris Scherzo and Tender are available in 50 or 100 ml Eau de Parfum. I’m looking forward to trying this duo. I’ve heard great things about Miller Harris. The bottles look pretty fantastic. Different from their usual look, but I like them too!